I never thought I'd see the day when I would spend twenty dollars for a makeup sponge. But after all of the talk, all of the ads, and all of the hype about the one from Beautyblender,® I caved and handed over my debit card with an audible gulp and a large helping of guilt. I shouldn't have felt so bad--this sponge is very different from most, well worth my splurge! It is completely latex- and ...read moreallergy-free. The design is ergonomic, with a tiny end so that you can work any and all cosmetics right up into the corner of the eye area with no problem. The bottom is more bulbous, for larger areas. This sponge is to be used damp for best results. One of the interesting aspects is that it doubles in size when completely wet, but it will shrink back to its original dimensions when dry. Use this to keep foundation from looking cakey. It works miracles to set a great powder (like "Make Up For Ever's HD" version) over a concealed blemish or discoloration to keep it disguised. Try using it with eye shadow for dramatic results (never thought of using a sponge with eye shadow, did you?). The longer I have it, the more uses I find. This will last for about four months with proper care; you do not need to purchase the cleanser from this company, as it's pricey. A gentle liquid like baby shampoo will clean it well so that bacteria does not cause contamination. What a find! The ONE thing you MUST have! I resisted and fought the BB for so long! I refused to spend $20 on a "sponge;" I had no idea how wrong I was. I spent waaaay more than $20 in BB "impersonators." The biggest problem is that the impersonators were way too dense and thick that it made it super hard for the sponge to create that flawless, dewy finish or to blend around curves such as the nose or eye area. Think the latex sponges of ...read morethe 90's but TWICE as dense - it made the sponges almost hard in comparison. The BB is NOT like that at all. It is incredibly soft, flexible, pliable and is just so easy to use - I can't tell you how pleasantly surprised I was! It was so worth the $20 - I can't even tell you. It gives a flawless, poreless, natural finish with no streaking (as SOME brushes can do). You MUST have this! 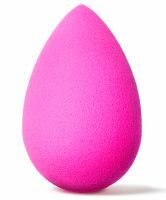 I debated getting the Beauty Blender for such a long time, despite the major hype that surrounds it just because it seems like a glorified makeup sponge. I also don't like that Beauty Blender tries to push its own (expensive) cleaning solution. I finally bit the bullet and bought the Beauty Blender but did not get their stupid cleaning solution. I clean my blender using normal baby shampoo and ...read morewater. Despite my skepticism, I have been thoroughly impressed by this tool! It is easy to use once you get used to it, and it makes each foundation look so smooth and flawless on the skin. I love using this with my heavier foundations because it prevents foundations from looking in any way cakey or heavy. This is probably because you are supposed to use the sponge damp. The dampness helps dissolve and distribute liquid makeup so nicely. What I don't like is that even after one use, your beauty blender gets stained and looks grimey. Even after you wash it, it doesn't look like new again. There is also no real easy way to store this sponge. Beauty Blender recommends using the original packaging to stand the sponge up, but who the heck wants to keep cheap looking plastic packaging on their vanity?! I worry about this collecting bacteria and at $20 a sponge, these are not cheap to replace. This is why I had to dock some stars. I am willing to invest money in quality makeup brushes because I know that when cared for, they could last a lifetime. The Beauty Blender will not last a lifetime, no matter what you do. It is an innovative product, but its price is too steep, in my opinion, for a sponge that needs to be replaced on a somewhat regular basis. Still, I will enjoy using this sponge and keep it as sanitary as possible. If you have issues getting foundation to apply evenly and aren't pinching pennies, give this a shot.